Incredible hardcover book detailing the history of Don Post Studios from its inception in 1938 to its closure in 2012. This is the Deluxe Edition with special custom collector slipcase featuring the Don Post Frankenstein Monster Mask, rubber and all! Blacksparrow is proud to present The Illustrated History of Don Post Studios by Lee Lambert. This limited edition handcover book details the history of Don Post Studios from its inception in 1938 through to its closure in 2012. Don Post Studios was the company responsible for the creation of the rubber Halloween mask and it was at the forefront of the "Monster Kid" phenomenon of the 1960s and '70s. The company was a leader in the Halloween industry for more than seven decades and also dabbled in special effects work for the film industry from 1947 through 1988. At almost 600 pages and measuring 9" x 12" (2" thick), this is a true anthology and definitive guide to Don Post Studios, the company that transformed an entire genre. 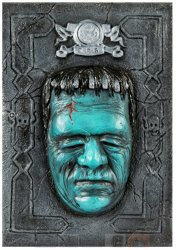 This edition comes with a special limited custom collector slipcase featuring a latex cover of the Glenn Strange Frankenstein relief mask. The Don Post Studios Tor Johnson mask released in the 1970s was DPS's best-selling mask ever. It is a fitting tribute to this monster caliber book. This sculpt and pull for this special slipcase was accomplished by the supremely talented Greg Duffy and Creature Revenge Studios. While supplies last we also offer the Hardcover Edition without the custom slipcase. Important Shipping Note: This huge, incredible volume is very heavy. By itself (and with other books or DVDs/VHS) it qualifies for economical Media Mail shipping. If you wish to also purchase items not in those categories, you may wish to purchase them in a separate order using a qualified shipping option.